We're back, after the short time off, and we bring with us our newest camping member. His camping nickname is "Oak". That's mainly to calm the fears of the grandparents who are scared of having his real name on the world wide web. Being liberal, EP and I tend to believe the best in folks. But, he will be referred to as Oak from here on out. Or at least until his 16th birthday and he drives of in his own camping machine. 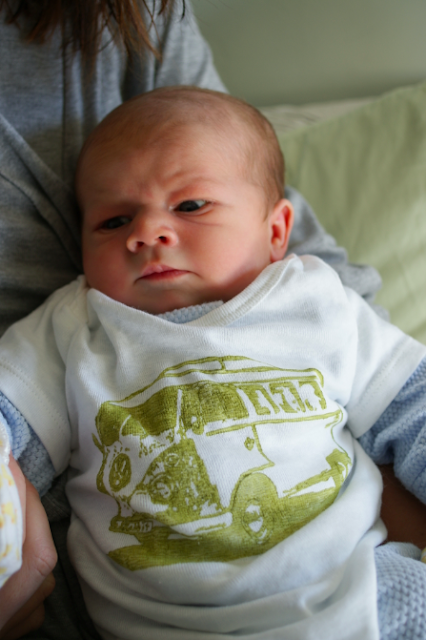 Anyway, here's a picture of the man sporting some excellent handmade VW bus evening wear. The split window onesie was sent to Oak by an good friend who found it at OhLittleRabbit.com. Cool shirt! Of course, he had it on for about 5 minutes before he "customized" it. So we will be taking a bit of time before our first camping adventure - looks like that will be the Annual Anti-Super Bowl campout in February. I'll be working on the '56 bug when I find time, but for now, I am spending the evenings watching Top Gear with Oak snoozing in my arms. It's a pretty good life. congratulations! He is one handsome little guy! Congratulations on the new addition to your VW stable. Best wishes for a happy life together. He looks so handsome and grown up already! I'm wondering what kind of music you were playing to him while he was basking in his happy little world before he was delivered? @whc03grady & Minnie - thanks! Monty - good to hear from you and thanks or the well wishes. Knox is going to witness a Big Blue roadtrip very soon! Carole - we were pretty generic - listening to The Beatles, The Grateful Dead and a ton of Bob Marley. We listened to Marley all through the delivery.